Anyone in Ohio wanna meet up/ ride? Inviting all central Ohio Riders. Thinking about setting up a Saturday ride down and around southeast Ohio. Its getting to be a nice time of year to ride. I am looking at Saturday September 22. 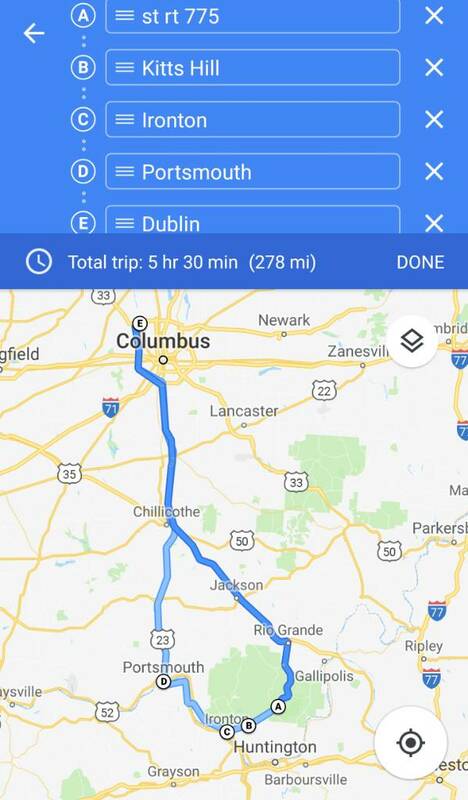 Meet up spot is not set in stone, but I'm thinking somewhere around Columbus/ Dublin would be a good place to start. The route is not set in stone either, but tentatively I would like to try to hit up st rt 775 close to the wv line, then follow the river along 52 till around Portsmouth, then shoot back north to c bus. That loop is layed out to be about 280 ish miles. If you would like to ride, let me know. I don't have a care to give what kind of bike your on, so long as it has at least a fairly descent chance of completing the ride lol Also, it wont be a blisteringly fast ride and im hoping to keep to 55mph roads and stay off the super slab. Re: Anyone in Ohio wanna meet up/ ride? I am 2 minutes from Ironton on the KY side of the river. I have been on some of those roads heading towards Gallopolis and many of them in Kitts Hill and Ironton. Some good riding! I'm healing up and soon rehabbing from knee surgery, but really hoping to get out on the GS750 starting around Memorial Day Weekend here come late May. I'm somewhat familiar with those roads down Gallipolis and the Crown City Wildlife Mgmt. Area. There are some good gems there for sure. I had previously planned on a 3.5 day riding/camping weekend down that way in Wayne National Forest early/mid may, but then I shattered my kneecap & my Colorado friends wanted me to take them on a tour of the Appalachians instead, so I'm not sure exactly what my June plans will be as far as riding trips. I'll plan to be scouting road conditions late May however, as soon as I can get enough strength back in my leg to ride. I certainly wont be able to ride dirt for a little while after that...best to stick to the street at first. Anyone interested in killer twisty routes down that way, by all means hit me up for advice and/or company on weekend rides.